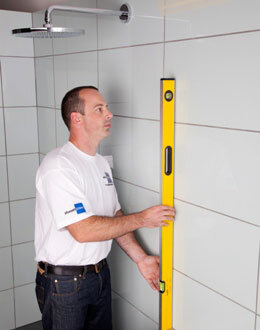 As the UK’s leading contractor and manufacturer of frameless shower screens and bath enclosures, we take health and safety very seriously indeed. We are pleased to say our meticulous and safety-conscious approach has now achieved industry recognition with the awarding of the nationally recognised SMAS Worksafe Certificate. SMAS (Safety Management Advisory Services) is a registered member of the Safety Schemes in Procurement (SSIP) Forum, an umbrella organisation promoting higher standards of health and safety for contractors and consultants. Our SMAS certification will therefore not only give a guarantee of health and safety competence to employees and suppliers but also demonstrate to our clients that we are serious about safety: reassuring, for example, when we are installing a supersize frameless glass screen in a challenging space. Health and safety has been central to Showerpower’s culture since the company was founded over 10 years ago – but it’s good to have official recognition of that commitment. We’ll be displaying our SMAS certificate and logo with pride. Like to know more about Showerpower’s approach to the design, manufacture and installation of bespoke frameless shower, bath, wetroom and spa screens? Or perhaps you have a specific project in mind? Why not request a brochure, email us, or call us now on 01403 829020.